I wish that someone would tell me that everything will be OK. I wish I had more support in my life. Don’t let people shun you if you ever been sexually assaulted, raped, etc. and if they do, they don’t know your story. They are not in your shoes and know what you been through. It was a nice summer evening, the sun was still out but on its way down. I just moved into the Continuum of Care elp 1 facility. Continuum of care is a Supportive living program. Anyways. about exactly one week later I was sexually assaulted by a man who does not live there. I was sitting on my back steps just admiring everything when this man walk up, acted friendly. At first I didn’t think much of it because I thought he was a resident wanting to welcome me into the program, as many of the residents there did. Not long after, I began to feel uncomfortable when he pulled out a big bottle of booze and started touching me. People I told were like why didn’t you get up and leave, why did continue to let him hurt you? I kept trying to explain that I had froze. I couldn’t get up, I was too afraid. Maybe about a half hour later, he led me to the basement, holding my arm. I tried to pull away but he gripped harder. In the basement was the wort part of the assault. he stripped me and began to do things to me. I was so afraid, but I still couldn’t move, and I couldn’t scream. That was almost four years ago. he never was arrested. The cops made it seem like I was wanting it because I let him. and his girlfriend would taunt me and have him on the phone on speaker phone saying things because he did get banned from coming to the program. After, my experience, I went through so many different emotions. The one emotion that was concerning to myself and to the staff there was anger. Over the years previous to the assault I was also angry. But this time was different. I would throw glass, plates, you name it. I threw a chair once across the room and even flipped a heavy table. I was so angry because I was building up so much emotions from the assault. Eventually that anger led me to the observation unit at Yale New Haven Hospital many times. Over the course of the year after the assault, I went to IOP at Yale. I went to DBT to learn how to cope with my anger. I dropped both as I felt they weren’t helping. I just can’t sit for four hours at a time learning how to cope. There has to be another way. Ding Ding Ding. I began Volunteering at the local animal shelter. I was so surprised they accepted me because they said it could take months for a volunteer to get a call after the orientation. I got a call within a week. working with the dogs was making me feel better. I was still receiving treatment at the young adult program. But in addition, I was helping myself and these dogs. There was one day when I broke down crying while walking one of the dogs, a pit bull to be exact. Pit bulls have a very bad rap. Anyways, while I sat down and cried while holding the dog leash, the beautiful dog came up to me and kissed me. It wasn’t until then that maybe animals were the true therapy that I may have needed. Unfortunately I couldn’t have pets at the place I lived at so I continued to volunteer. After thanksgiving, two years ago, I moved into a different apartment complex, still part of continuum but a this time ELP2. I broke the no pets rule shortly after my best friend died, which was several months after I had moved into that place. 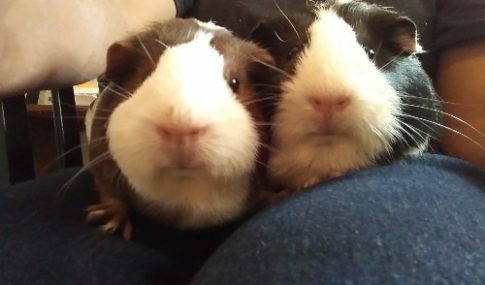 I adopted two female guinea pigs. I was able to keep them due to my high anxiety, my ptsd that I developed after I was assaulted and the depression. I eventually got a doctors note from my psychiatrist stating that they were my emotional support animals. That was the best thing. I feel these girls saved my life as I was ready to give up on everything. Now I have my very own apartment, not part of continuum. I still have my girls whom I spoil every day. I’m like, they help me in so many different ways, why not spoil them? I have a job and My anxiety level isn’t as high as it was before I got them. I am able to manage my anger a lot better. I still deal with anxiety, I’m not sure If I will have it the rest of my life. But I learned better, healthier coping skills. If you are struggling, it’s OK to fall down, everyone does. Just pick yourself back up and keep trying. Teach yourself new ways to cope, don’t give up because eventually you will find the right one. I wish that someone would tell me that everything will be OK. I wish I had more support in my life. But having these animals are the real support that I needed. LEAVE ESTRELLA FEEDBACK AND WELCOME HER TO THE FORUM, HERE!